Sara is the Client Services Coordinator at The Robinson Law Firm. Sara's voice is often the first one you hear when calling our office. She is responsible for seeing that a client's initial needs are met: including scheduling appointments, guiding them through our 5-Step Wealth and Legacy Preservation System, and triaging phone calls. Sara's caring attitude and attention to detail make her the ideal point-of-contact as she helps us exceed client expectations and keep our office running smoothly. Sara is also the Marketing Assistant at The Robinson Law Firm. 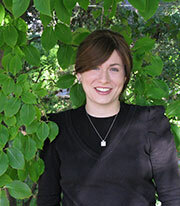 As such she is responsible for implementing and coordinating the Firm's marketing efforts. She is also the point-of-contact for advisors interested in working with our Firm. Working closely with clients of the firm, Sara demonstrates a high-level of professionalism to see that the needs of our clients are promptly and capably met. Sara was born and raised in Philadelphia and she lives with her husband, daughters and son.